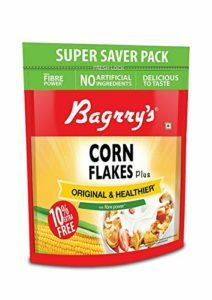 Amazon is here with a great deal offering Bagrrys Corn Flakes, 800g (with Extra 80g) at Rs 170 only. The taste of original Cornflakes with the added goodness of fibre! Try the new Bagrry’s Cornflakes Plus which is more than just your regular cornflakes. Grab Now..!! How to Buy Bagrrys Corn Flakes, 800g (with Extra 80g)?